Moldavian Dragonhead is an annual, aromatic herb, with erect stems 15-30 cm tall, usually branched from near the base. Stems are bristly with short retrorse eglandular hairs. Leaves are about 1.2-2.5 cm long, 0.7-1.5 cm wide, oblong-ovate, toothed, base wedge-shaped to flat. Both surfaces have short eglandular indumentum, and sessile oil globules below. Flowers are borne in distant 6-flowered whorls. Bracts are oblong, with long awns. Flower-stalks are 2-5 mm, flattened. Sepal tube is 0.8-1 cm, two-lipped with prominent ‘folds’ at the sinuses. They are densely covered with very short eglandular hairs and scattered stalkless oil globules. Upper lip has 3 ovate nearly equal pointed teeth. Lower lip has 2 lanceshaped pointed teeth. Flowers are about 2 cm long, bright blue violet, externally hairy. Nutlets are 2.5 x 1.2 mm oblong, trigonous, brown, apically truncate, with a prominent V-shaped attachment scar. 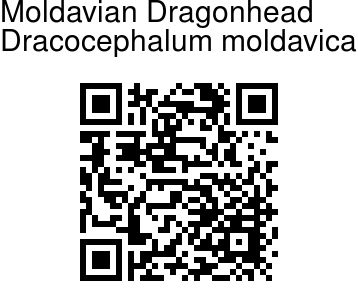 Moldavian Dragonhead is native to temperate Asia, widely naturalized in Europe. 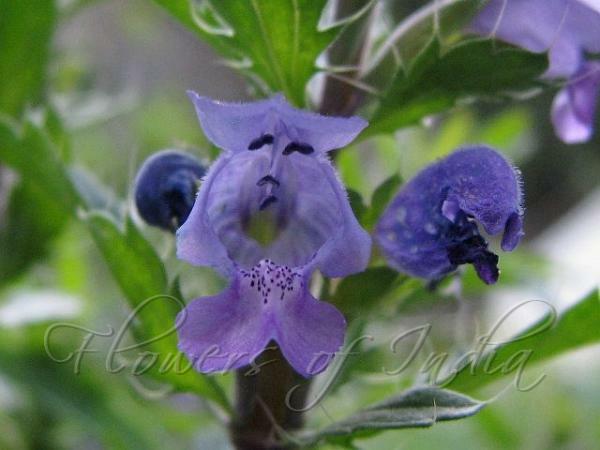 It is cultivated in India for its essential oils. Flowering: July-September. Photographed at Turtuk Village, Ladakh.